Whether your connection to BIICL was as a research fellow, an intern, a volunteer or a member of staff, the Alumni Network enables members to reconnect with colleagues and with us, to attend events, participate in discussions, reach business and academic contacts and to share accomplishments. Our Steering Group is responsible for developing the activities of the Network. Established in 2015, there are now groups working on social media platforms, newsletters, fundraising and events. The member's Directory for the Network is on the BIICL website and is only open to members of the BIICL Alumni Network. If you are already a member click here and log in with your regular BIICL details. If you would like to become a member, please get in touch with the Membership Team. If you are in touch with more past BIICL contacts, please encourage them to join our group. To ensure we have your correct current details and to discover more about what members want to get from the group, complete our short survey here. 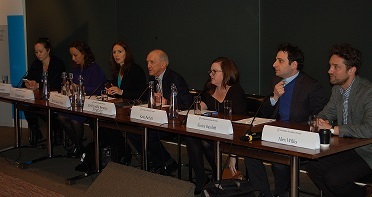 There was a panel discussion chaired by Sir Franklin Berman and the speakers included Andrea Coomber, Merryl Lawry-White, Kate Parlett, Jiries Saadeh, Elham Saudi and Alex Wilks. This was a fantastic opportunity event where we heard from lawyers and barristers working in diverse areas of public international law about their career paths and perspectives on future careers in this field. Many thanks those of you who helped out on the night and to all of you who were able to come along. The Scheme offers 6-9 positions as Research Assistants each year, receiving the London Living Wage for their 4 months work at BIICL. We also contribute to the £10 daily allowance towards travel and subsistence expenses for the additional Volunteer Researchers. For more information on this campaign and how to get involved click here. "Alumni international law since 1958 for a global community | BIICL"